Announcing tickets on sale Friday, April 29 for Moscow Ballet’s celebrated Great Russian Nutcracker in York at The Pullo Center on Wednesday November 30, at 7:00 p.m. 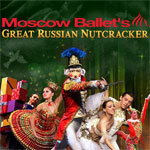 Direct from Russia, the classic Great Russian Nutcracker will entertain the whole family this Christmas. Experience the exceptional dancing of a company of almost 40, a 60-foot growing Christmas tree, new and spectacular hand-made costumes by Resident Designer Arthur Oliver, and stunning sets hand-painted in Russia and designed by multi-Academy Award nominee Carl Sprague. Moscow Ballet consistently garners critical acclaim for performances in 100+ cities from New York to Los Angeles, and Miami to Calgary. The production is known for its dedication to world peace: naming Act II the “Land of Peace and Harmony;” featuring a rose shooting cannon, and a stunning 2-person “Dove of Peace” with a 20’ wingspan. Tickets start at $30.00. Groups of 10 or more, including Girl Scout troops, Seniors (65+), Military, and Motorclub are eligible to receive discounts for this performance. To receive your group discount, call The Pullo Center Box Office at 717-505-8900 or email alp20@psu.edu. For Platinum Experience featuring a Meet & Greet; Gold Circle Gift Package; and single tickets call 717-505-8900 or go to ThePulloCenter.com. Moscow Ballet – 2016 is the company’s 24th consecutive year touring North America. In addition to the popular Great Russian Nutcracker, company repertory includes classic ballets Swan Lake, Sleeping Beauty, Romeo and Juliet, Cinderella and more. The company features award-winning and rising star dancers, from Lilia Sabitova in 1994 to Alisa Voronova in 2014. The company performs 100+ engagements annually across Canada and in most of the United States’ largest cities consistently receiving critical acclaim. In addition to public performances, Moscow Ballet dedicates resources to community engagement programs. The 23 year Dance with Us program shares the Russian Vaganova ballet training with over 5000 American dance students annually bringing them on stage in ancillary roles to perform side-by-side with the professionals. Underwritten by Moscow Ballet, the program was developed by choreographer and co-producer Mary Gianonne Talmi. The intensive cultural immersion project “New Horizons – A Children’s Program for Life” benefits thousands of school children in tour cities and programs Musical Wunderkind and Summer Intensives also touch the lives of many children and young adults. Moscow Ballet’s partnerships with corporations and not-for-profit organizations such as the President’s Challenge Program and Children’s Hospitals, has raised significant revenue. www.moscowballet.com. Talmi Entertainment is the exclusive North American representation for Moscow Ballet which performs annually in more than eighty cities from NYC to LA, and Miami to Calgary. Under Talmi Entertainment management Moscow Ballet delivers unparalleled Russian artistry in the classic ballets Great Russian Nutcracker, Romeo and Juliet, Sleeping Beauty, Cinderella, Swan Lake and more. Upon the fall of the Iron Curtain in the former Soviet Union, Talmi Entertainment presented the “International Glasnost Tours” featuring leading prima ballerinas form several Soviet countries and out of which grew the annual Great Russian Nutcracker tours. “Glasnost” featured highlights from the great ballets and the newest contemporary choreography. The dancers included Vadim Bondar, Svetlana Smirnova and Tatiana Chernobrovkina from Stanislavsky Ballet; Alexei Malykin Bolshoi Ballet; Vladimir Kim and Margarita Kullick Kirov (now Mariinsky) Ballet; Stanislav Fecho and Prima Ballerina Jana Kurova of the National Ballet of Czechoslovakia; Maria Ivanova and Andrei Glazsheider of the Stanislavski and Demirovich Theatres. Talmi Entertainment was founded by award-winning Juilliard School alumnus, composer, conductor and producer, Akiva Talmi.